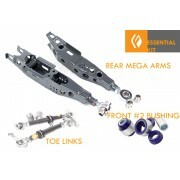 MORE THAN A "CAMBER KIT"
Adjust and correct suspension geometry for lowered vehicles. This includes correcting camber, toe balance and clean cycle. Through adjustment, END REAR INNER TIRE WEAR by counteracting the toe link arc swing. This commonly happens on lowered Lexus vehicles due to angle of the toe links causing rear toe steer. This is the number one cause for tire wear, not camber alone as many speculate. Make them light to improve suspension response. Retain factory alignment adjustments with the stock eccentric bolt. This would make alignment maintenance non specific to our arms and allow non specialized shops to perform alignments. Withstand the trials of track punishment but not give up significant ride comfort for daily-driven cars. Create an affordable open platform to give customers options for customization and cost minimization. Custom color powdercoating, minimal uncoated offerings, choices of rod ends, changes to match specific vehicle setups, custom gusseting and weldments. 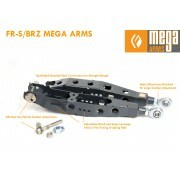 In 2005 feeling all above goals were met and exceeded expectation, we released our first generation of MEGA arms. 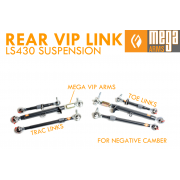 Now on our 5th generation, MEGA arms from FIGS offer a simple universal solution to lowered suspension issues on numerous Lexus vehicles. 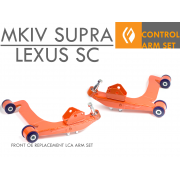 We continue to expand our offerings as we can get test vehicles and make design modifications. Now lighter, stronger and with lower entry product offerings, these are truly a bargain for the technology and function they provide. 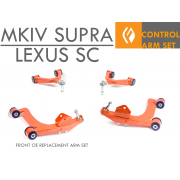 In fact, for less than the cost of a pair of tires, these will put control back into your lowered suspension with this simple to install lower control arm upgrade. We guarantee your satisfaction. 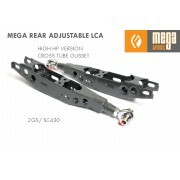 Add increased Camber adjustment to support lowering vehicle up to 2.5". Also Allows more negative camber for increased cornering stance and pitch. 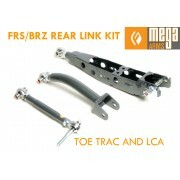 (It is suggested to also purchase adjustable Toe Links (below) for negative camber applications. Free travel with spherical rod end replacing stock bushing. No more rubber binding under power or preloading and wearing out prematurely. Boxed construction positively locates the rear end meaning more traction. Rigid construction keeps energy storage in arm to minimum. 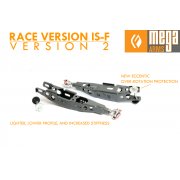 RACE version has dimpled and lightened sheetmetal to maximize stiffness and reduce swing weight. 2-Piece FIGS FXM MOTOrsports rod ends for daily driven applications. These rod ends provide the high shock loads for the daily riggors of unmaintained roads, potholes etc. Injection molded Teflon composite race and Chromoly construction. 3-Piece Aurora AM Precision rod ends for Track applications featuring teflon liners. The best rod end we could source featuring precision pressed bearing races and a Teflon liner. Still a strong bearing but has a lower shock load value which makes them perfect for track surfaces. Multiple Sway Endlink Mounting locations to dial in angle and engagement. 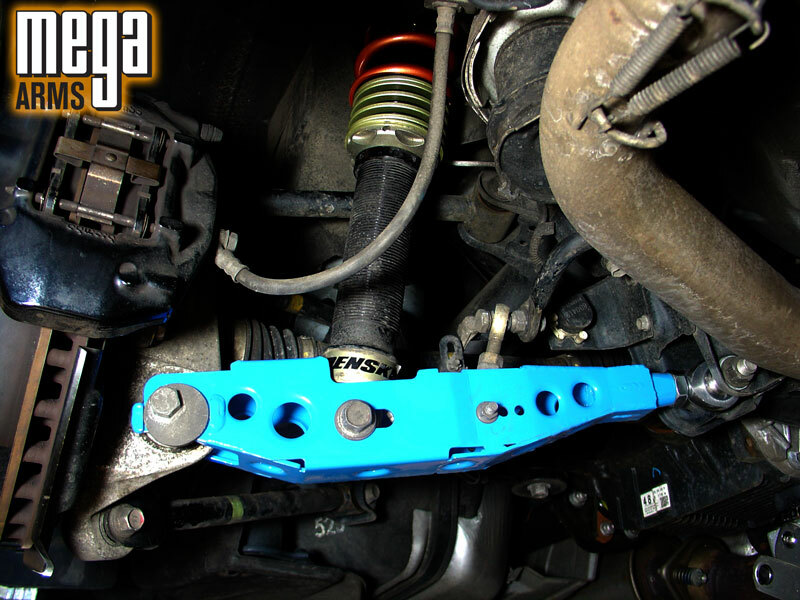 This can help reduce sway bar preload or purchase our adjustable sway endlinks to eliminate preload all together. Sliding Shock Mount allows fine tuning of leverage and ride height. This effectively modifies the spring rate to allow for slight dynamic balancing. Out to increase and inward to decrease leverage and rate. Allow camber adjustment with arms still on vehicle via stock eccentric adjustment. Saves time and money during alignments. Eliminate rear bump steer and inner tread wear. These balance the steering force of the toe link on the front side of the rear hub. This is the proper linkage to correct camber. Rubber boots available for harsh environments. 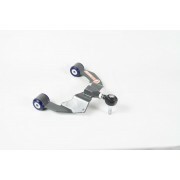 *These require packing with bearing grease to allow free movement. 2-year warranty against defects in craftsmanship. Try getting that from a JDM company. Powder coating available but most arms are delivered bare steel for lowest cost. ARMS DO NEED TO BE COATED PRIOR TO INSTALLATION. Please see the CARDINAL COLOR SHEET LINK for color options. 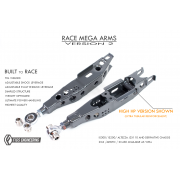 Available as Entry Economy "EE" which is our entry level product that is MIG welded and "RACE" version which are dimpled and gusseted for high-horsepower or track cars or cars that demand the highest performance.